The Amano Group considers two important managerial challenges to be emphasizing the importance of corporate ethics and maintaining sound management. By establishing organizations and management systems to implement and push forward with these policies, we aim to increase trust in our company; to this end, not only do we comply with relevant laws and ordinances when carrying out our business activities and performing our duties, but also management takes the initiative in making the need to act according to ethical standards fully known to all personnel. Through these efforts, the Group ensures the effectiveness of corporate governance and realizes fair, transparent management. The Board of Directors consists of nine directors, including two part-time outside directors. In addition to regular meetings, the board flexibly convenes extraordinary meetings as required to deliberate and decide upon important matters concerning management as well as to report business progress. Thus, the Company has put in place a system to facilitate swift managerial decision-making. From the viewpoint of improving corporate governance, one outside director was elected at the 97th Annual Shareholders Meeting held on June 27, 2013, and another was added at the 99th Annual Shareholders Meeting held on June 26, 2015. The Articles of Incorporation stipulate that Amano's Board of Directors shall consist of no more than ten directors. In order to clearly define the functions and responsibilities of management and for business performance as well as to ensure swift decision-making and achieve greater management efficiency, the Company introduced the operating officer system in April 2005. Of the 17 operating officers, 5 also serve as directors. The Audit & Supervisory Board consists of four members, including two part-time outside members. In addition to attending Board of Directors meetings, Audit & Supervisory Board members actively take part in the sessions of internal committees and other meetings in order to monitor directors' performance of their duties and to work with the Internal Audit Unit to more effectively supervise business performance. 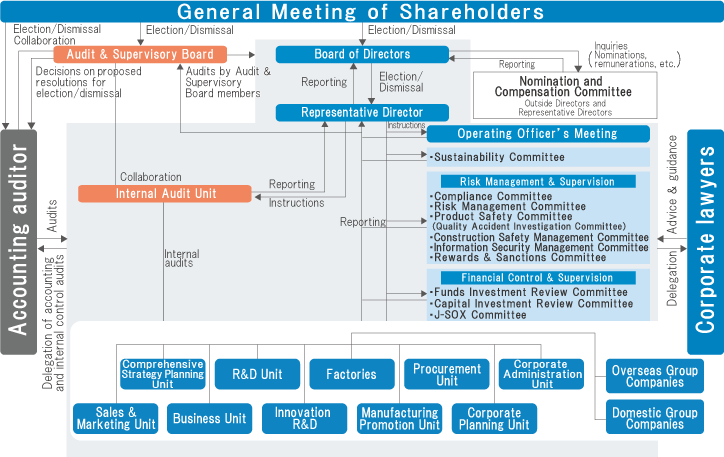 In order to make the functions of the Board of Directors more independent and transparent as well as to ensure greater accountability with the aim of further improving corporate governance, the Company has set up the Management Advisory Council, which consists of outside directors, outside Audit & Supervisory Board members, and Representative Directors. The Council discusses important matters such as appointments and dismissals of executive, their remuneration and successor training program from its members' independent viewpoints by making use of their extensive experience and technical knowledge. In addition, the Amano Group convenes sessions of the Domestic Strategy Conference (for group companies in Japan) and the Global Strategy Conference (for group companies overseas) as required in order to grasp group companies' management statuses. In this way, we are enhancing our management monitoring capabilities to ensure that corporate ethics permeate the entire group to realize more effective corporate governance. The Amano group recognizes that in a business environment where risks are becoming increasingly complex and diversified the formation and the operation of appropriate internal controls along with risk management structures are vital for gaining market confidence. Under this recognition, the Amano group's management policy clearly indicates its strong commitment towards "legal compliance and public benefit". Amano regards the activities of its various committees as being the core of CSR (Corporate Social Responsibility) and along with the risk management framework, forms the foundation to achieve its management policy. Thus Amano will continue to strive to enhance these committees and risk management. The promotion of risk management initiatives in business and management activities. The fault investigation committee works to eradicate damage from market quality faults that exert drastic effects on business operations, prevents unforeseen merchandise faults, and prevents reoccurrence, and provides damage relief. This committee maintains and operates a system involving construction safety such as for structural work, civil engineering work, and equipment installations, etc. This committee maintains and continuously improves management systems that involve safeguarding personal information and information security. This committee sets up on-site sub-committees that look over; toxic substances & equipment, global warming prevention, waste disposal, promotion of environmentally friendly products, promotion of environmentally friendly parts & materials. This committee gives consideration to appropriate rewards and sanctions towards company employees. Reviews the appropriateness of funds control and operations. This committee formulates capital investment plans and conducts half-yearly reviews. It also examines individual investment projects, cost performance, and the allocation of budgets. This committee provides manages the internal controls for financial reporting in compliance with J-SOX regulations. Furthermore, the Risk Management Supervising Director will head the Risk Management Committee, Product Safety Committee, Construction Safety Management Committee, Information Security Management Committee, and the Environmental Management Committee. The Financial Control Supervising Director will head the Funds Investment Review Committee, Capital Investment Review Committee and the J-SOX Committee.